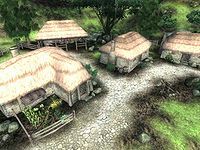 Water's Edge is a village north of Leyawiin (quest-related). The citizens of Water's Edge live a simple life, wandering around and enjoying the river nearby. Biene Amelion has a family crypt nearby the small town. It consists of three houses and a few gardens. During the Infiltration quest, the entire population of Water's Edge is massacred by the Blackwood Company. The exception is Marcel Amelion, who was absent at the time. Esta página foi modificada pela última vez à(s) 05h52min de 9 de junho de 2013.